Every day, more and more people are waking up and discovering that Monsanto and their many products are being found to be a hazard to human health. It does not matter how much PR money Monsanto spends, people all over the world are realizing the truth. 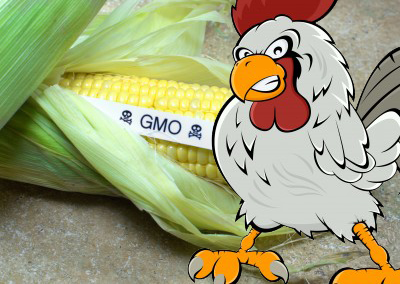 Last year’s first real independent GMO study conducted in Europe demonstrated the long-term effects of GMO corn and the effects of Monsanto’s herbicide Roundup fed to rats. The tumor growth rate of the lab rats fed a GMO diet was alarming. This sparked a huge grassroots movement culminating into the March Against Monsanto, which took place on May 25th 2013 and drew in millions of people in over 400 cities across the world. Finally humanity is waking up to the reality of GMOs. In April 2013, MIT scientist Stephanie Snell PhD, co-author of a top study on glyphosate, explained in an interview how this chemical, which is the broad-spectrum systemic herbicide used by Monsanto in Roundup, is quite toxic to our health. The transcript of the interview is available here. How Does Monsanto Get Away With It? Monsanto and all these other big corporate giants depend on your acquiescence in order to succeed. They spend billions of dollars combined in PR campaigns and advertisements counting on mass public ignorance in order to continue pumping profitable GMO and toxic herbicides into our food system. The best form of activism is to become a leader, that is, leading by example. You may not have participated in the March Against Monsanto nor do you have to be on the front line protesting against GMOs to take a stand. Activism starts with standing up for yourself in even the smallest of ways. Anyone can start flipping the bird to Monsanto today by making better choices and honoring your bodies and minds. By complying with yourself every day you are in fact not adhering to and supporting a system that really is a house of cards.The more we comply with our own self interests for the betterment of humanity, these giants will eventually fall or have to change. One of the biggest misconceptions that the public is indoctrinated with is the perception that, “I am one individual, what difference can I make?” In reality we all have the power to affect change and it really does start with what we do in our lives and our buying habits. Put your dollars to work in the local economy by supporting local stores, your local farmers and start breaking the chains from the big department stores which all carry GMOs. Let’s keep the profits in our local economies and reward our local farmers for trying to do the right thing. There are many programs, which are called community-supported agriculture or CSA where you can start to make an impact by supporting a local farmers and keeping them away from the grips of Monsanto. Food choices: Begin by making better food choices and nourishing your body by getting rid of all GMOs. The biggest GMO offenders are corn and soy, in addition to some wheat sources, which unfortunately are ingredients in most processed foods. Switch to an organic diet of mainly fruits and vegetables along with lean meats and nuts. Many people have reported that after they get off GMO foods, that within a few weeks they start feeling a lot better. Start juicing: Getting in the habit of juicing organic non-GMO fruits and vegetables, even if just 2 to 3 times a week. This is a great way to start loading your body with highly bio-available nutrition. The reason why juicing is so important is twofold. First, you are able to consume the nutrition of substantially more fruits and vegetables than you typically could eat in one sitting, while also helping support local organic farmers by purchasing more fruits and vegetables than you normally would. Plant a Garden: This is one of the best ways you can cost effectively have full control over where your fruits and vegetables are coming from. Even if you can’t take care of all your needs, this can help supplement what you are buying from local organic farmers. Every dollar you are not spending on GMO products helps to change the system. As the character, Howard Beale in the movie Network famously exclaims; “I’m a human being God dammit my life has value,” we as a society also need to come to this realization and not let our health be compromised in the name of corporate interests and profits. It’s time to affect change every day by the small choices we make in our lives. It’s time to disconnect from the propaganda that the big corporate giants such as Monsanto perpetuate on society, so we can stand tall in our own existence and comply with humanity’s best interests. Through leading by example we are in fact flipping the bird to those who do not care about us and only want to profit from our lack of knowledge. Please leave your comments below; I’d like to hear your thoughts and suggestions on all the ways we can comply with our best interest and stop acquiescing to any big business or agendas.